Construction is scheduled as planned. Donations are always accepted and encouraged from both individuals and businesses to not only stock our Habitat Home Centers but to also lessen our carbon footprint. And earlier this year, the Habitat Home Centers were able to assist a local major bank do just that! Our partner company recently underwent a renovation and was replacing carpet tiles in their buildings. The Habitat Home Centers received over 93 pallets of 18 x 18 gently used high quality carpet tile totaling approximately 65,000 sq. ft. That’s 96,000 pounds of material that was diverted from the landfill! 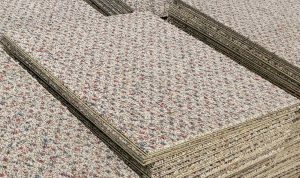 Going a step further, the Habitat Home Centers are able to sell those carpet tiles to the public at just .50 cents each where normally a customer could pay upwards of $8 a tile. Now that’s a huge savings! Customers feel good about not only the savings but also that they are helping local families in need. The proceeds we make in the stores help fund Habitat for Humanity of San Antonio’s home building program, a program for low income first time home buyers who don’t qualify for a traditional mortgage. We’re so grateful that we were able to assist in this positive environmental impact that not only benefits our current residents but future generations as well. Are you an individual or business about to undergo a remodel or office furniture turn over? Contact the Habitat Home Center to learn more about how to partner or visit our “How to Donate” page.